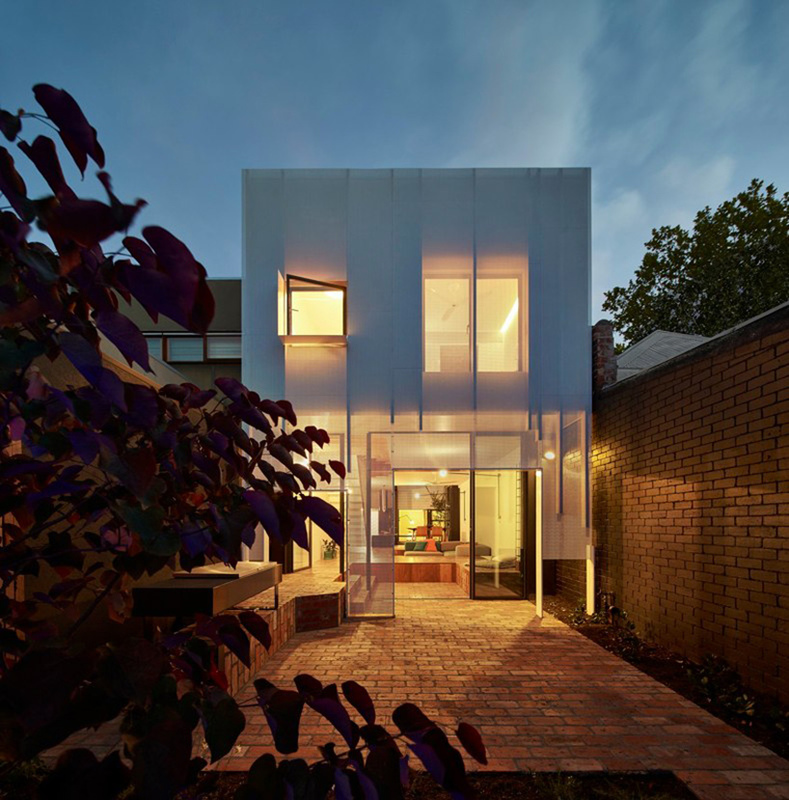 austin maynard architects, formerly known as andrew maynard architects, is an australian architecture practice based in melbourne. australian practice austin maynard architects has completed the renovation and extension of a single storey weatherboard terrace in melbourne. 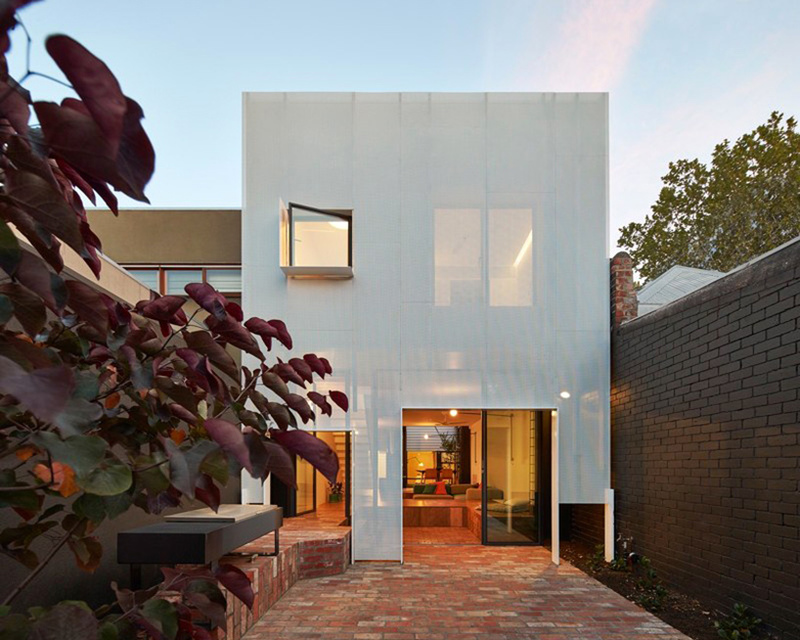 the home’s existing façade and front two rooms are maintained, while a large lightwell separates the original structure from the new build. 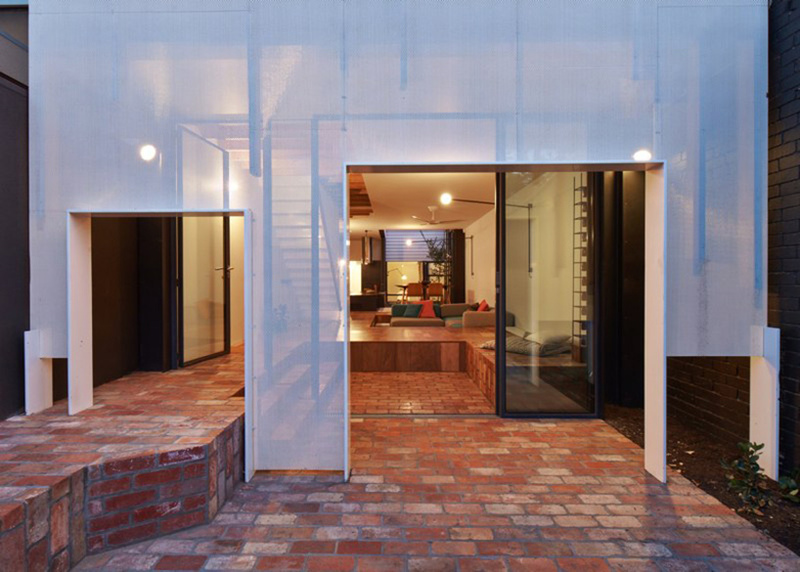 the project includes two additional bedrooms and a bathroom above an open kitchen, living, and dining space. 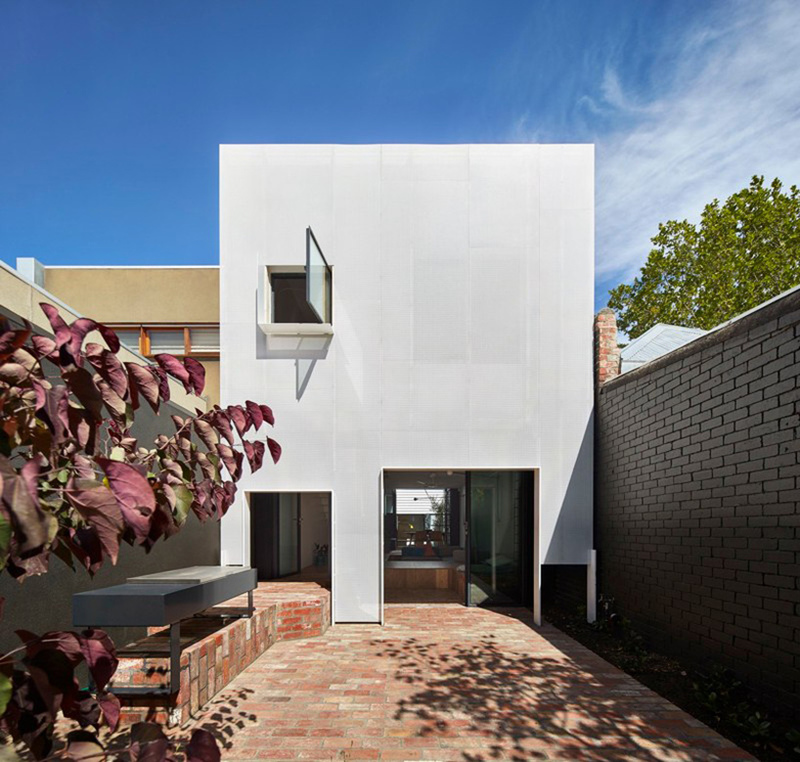 referred to by the architects as ‘mills’, the dwelling is articulated around two core ideas: firstly, that the floor is a giant toy box for the client’s young children, and secondly that the rear elevation filters the strong sunlight that had previously dominated the backyard. 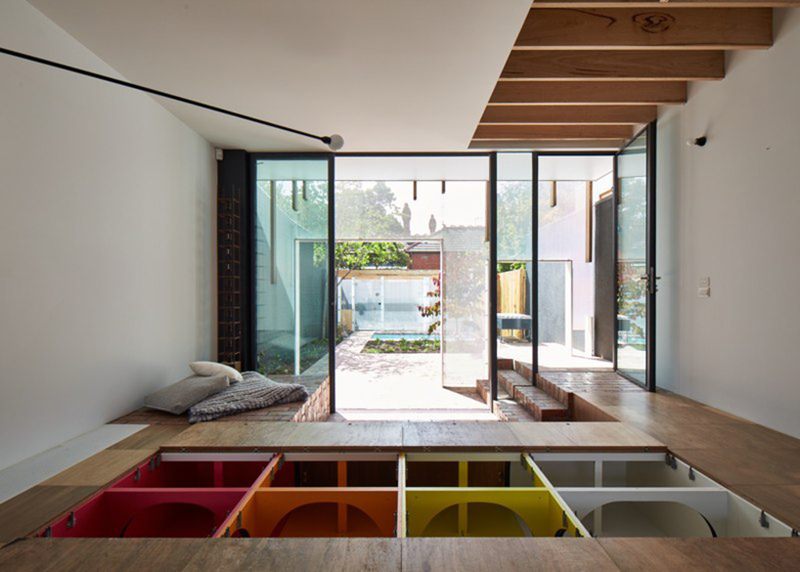 in order to maximize the internal living area, the design team decided to limit the use of bulky wall cupboards by utilizing floor space. through incorporating storage within the floor, children are able to keep their toys out of sight. ‘we have made gravity the parents’ ally rather than the child’s by enabling the floor to swallow all the mess,’ explain the architects. ‘rather than picking toys up to put back in the toy box, we’ve made the floor one big toy box.’ as the floor is 450 millimeters deep, it also provides adults with a place to sit at a comfortable height. other space saving techniques include limiting corridors. 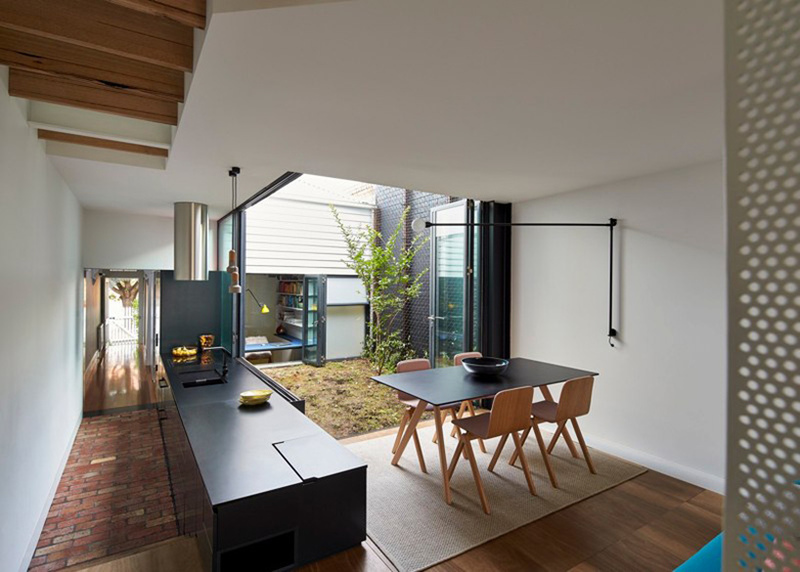 as the home’s kitchen occupies the original passageway, the substantial space the kitchen would have occupied in a typical location has instead been used for living accommodation. 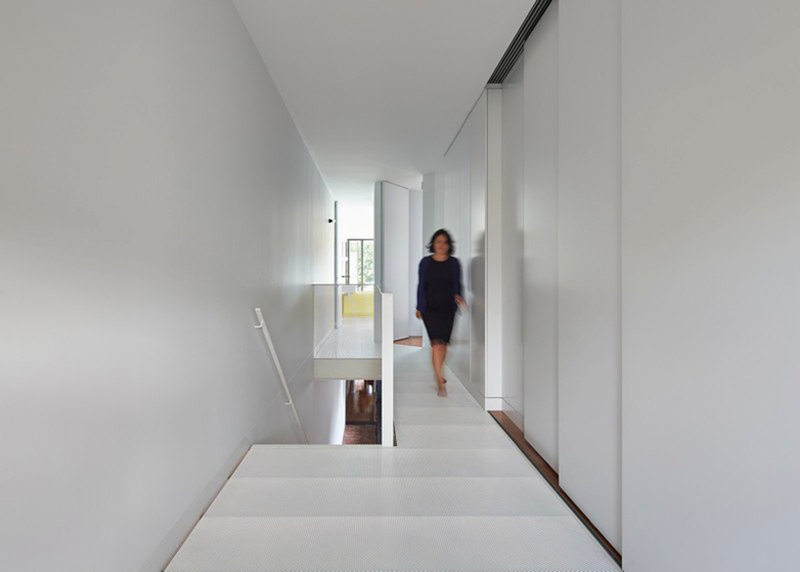 upstairs, the master bedroom wall can slide entirely away so that the volume can increase almost two meters in length. perforated metal has primarily been used externally to control and filter direct sunlight, yet it has also been used internally on components such as the stairwell. 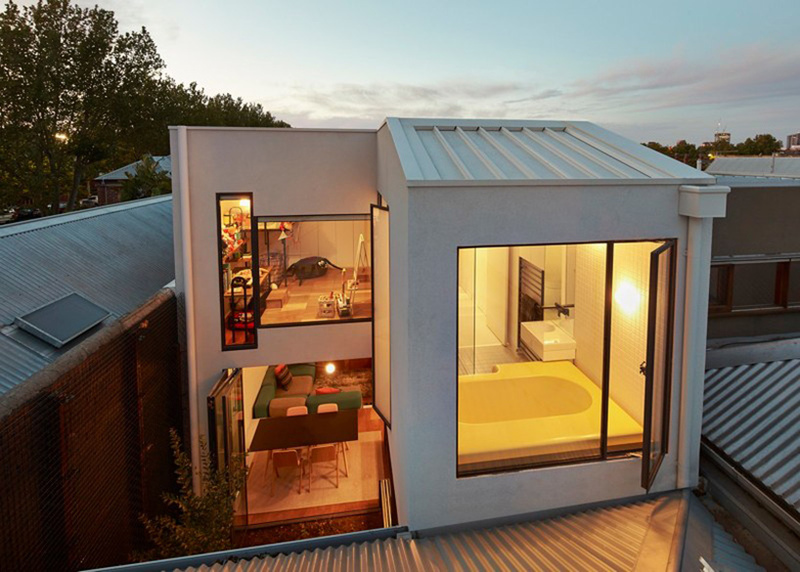 as the bathroom is not big, large windows have been employed, oriented towards both the lightwell and the original roof. 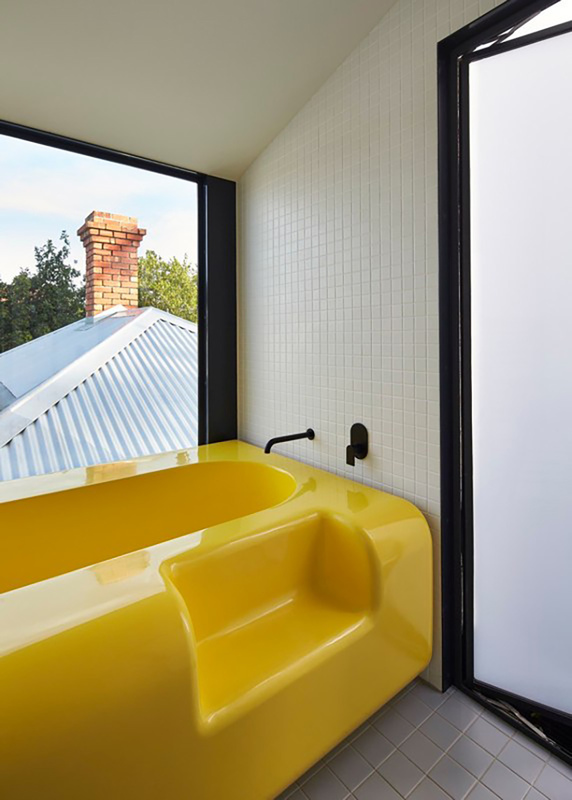 the architects even designed a bespoke bathtub with no seams or joints, thus ensuring that the bathroom is easy to clean and maintain without the problem of grime or mold. openings and windows have been designed to optimize passive solar gain, thereby reducing demands on mechanical heating and cooling. all windows are double glazed, while the need for air-conditioning is eliminated through active management of shade and passive ventilation. greywater is captured and reused to flush toilets and water the garden. solar panels with micro-converters cover the new roof. This interior is amazing. Love the staircase design.